There’s many styles and methods of Martial Arts, and among those you have diversion on what’s the best of the best. All Muay Thai and BJJ may look the same for example, but to a trained eye the differences in strategy, technique, and quality can be astounding. Experts can look at a method they haven’t personally studied and find the similarities in their own form of self defense. Kickboxing is a loose term for all methods of combat and sport that use the hands and feet at a minimum. Muay Thai for instance utilizes the elbow, knee, and clinch to create an effective arsenal that can be used in the street or in the ring. Using all the tools available to the practitioner Muay Thai became known as the art of 8 limbs denoting its versatility. Muay Thai isn’t alone in its effectiveness, although it has come into fashion lately as a work horse art. It’s a phenomenal workout and gets the job done in a short amount of time while offering some depth and strategy. Muay Thai is the most popular modern vehicle for MMA, and often emulated and copied by gyms that have no formal Muay Thai training. Classically Muay Thai is known for its power, as most matches are 3 rounds in total, giving a well conditioned fighter a chance to go all out from bell to bell. As these styles continue to evolve we’ve seen Muay Thai make a shift to a sub style called “Muay Thai Femur.” A Femur stylist is known as a technician, think of someone like Saenchai with great footwork, head movement and utilizing all the tools of the game. This is currently the exception as Muay Thai is very straight line it’s assault and what it does, it does extremely well. At River City Warriors in Tigard we encourage all of our Jeet Kune Do (JKD) students under the Inosanto branch to take at least two years of Muay Thai to have a solid foundation in that structure. JKD also encompasses kickboxing styles as the legendary Dan Inosanto and his teacher Bruce Lee studied many forms of kickboxing. 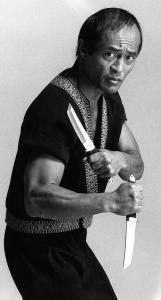 Inosanto would go on from the mid 1970’s until present day and participate in countless hours of dedicated training in Savate, Muay Thai, Cambodian and Western Kickboxing. These methods have been further integrated into the modern JKD program. Bruce Lee in fact coined his own style of Kickboxing before JKD was developed called “Lee Jun Fan” which is his Chinese name. Savate is a French method of kickboxing dating back to the 1600’s. Much like Muay Thai it can be traced to war time and the use of weaponry as a craft merchant sailors used defend their ships. The high kicks were easy to pull off because they’d grip the deck rail to throw the leg at their adversaries! Eventually this style made its way back home and was adopted by both the upper and lower classes at the time. The high society version revolved around the use of a cane, literally called Combat De Canne, which was used to settle civil disputes without the use of a sword. Savate hit it’s last wave of popularity in the 80’s and 90’s when America was tuning into to Kickboxing on ESPN. While it’s not in a slump by any means today it isn’t widely televised and most practitioners have to compete under Thai or kickboxing rules in order to find a match. Savate adds an interesting dynamic in that fighters traditionally wear shoes with a sole during the match. They use the footwear for pinpoint accuracy and also to add power to what would be a lighter kick when thrown barefoot. It’s characterized by the use of finesse and footwork to develop an elusive and highly mobile practitioner. It has been said by Dan Inosanto that Bruce Lee used his front leg in a Savate style and his rear leg had the power of Muay Thai. This is still emphasized in a quality JKD school like RCW. 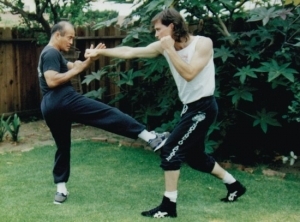 There is a deep kickboxing component within Jeet Kune Do and given enough time the students develop a balance blend of balance, speed, agility, and power. I still recommend all my JKD students who have an interest to cultivate these methods individually which is why we offer a full Kickboxing and Muay Thai program. Over the years the one’s who’ve decided to jump in to the Muay Thai class have had quicker access to the foundations and generally do better in sparring. JKD has a lot to cover on it’s own as we use the shoe from Savate, but also incorporate street relevant movements into the training: the eye gouge, hitting to the groin, hitting to the throat, etc. By far the most important thing, is picking a style of kickboxing that you like best and seeking out quality. We finally come to the key commonalities among all of these styles that I want to illustrate. As a point of origin these methods all have one thing in common, they weren’t intended for pure sport AND they came from weaponry. Muay Thai originated with clashes between Myanmar and other neighboring nations. They have a host of weaponry including long swords and wooden forearm shield called Mae Sok. We already discussed Savate had the cane and came from a fencing influence. Western Boxing is also attributed to such a pedigree, originally practiced with a sword and shield, James Figg is credited as the father of modern boxing. Eventually the weapon gave way to sport and Figg became Britain’s first champ in the early 1700’s. That’s right. At one time, all these mixed martial art styles had weaponry in common. Have they come too far, or is there something that can be gleaned from this today? Absolutely! If you’re going to take your training beyond its limits, kickboxing provides one of the most sure ways to have a solid base across arts. It’s a direct link to almost any other system because of it’s origins with the weaponry and how it functions in every range. Watching the UFC lately? It’s pretty rare that someone will just shoot in for a takedown, but they’ll use a setup and come in behind a jab, a knee, a leg kick, etc. Into classical styles like Wing Chun? A lot of people in Wing Chun find it hard to close the distance, blend it with a kickboxing style and you’ll find it’s much easier. At RCW we offer a Kali class, which explores all manner of handheld tools including the knife, sword, and stick. The movements from kickboxing and boxing are always found in knife fighting as well from the stance and footwork to the guard positions as well. In closing, if you want to add a commonality to all of your other training, kickboxing is the way to do it. As MMA continues to evolve we won’t see as many “Muay Thai” fighters, but a fusion of well rounded techniques hand picked from all these styles.